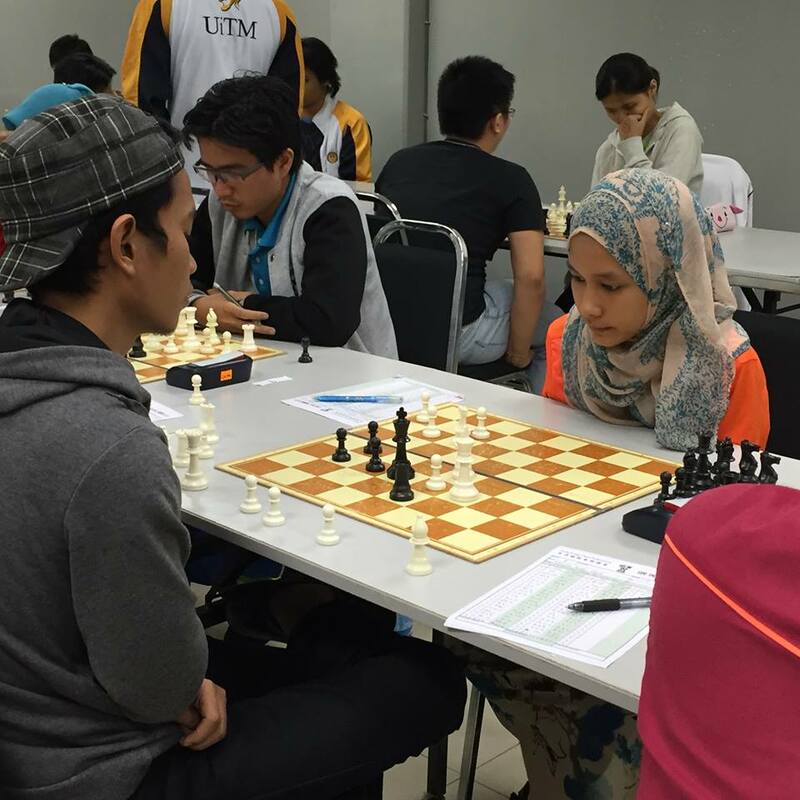 The three-day UM-KPT Chess Championship has just concluded today. All the participants both Male and Female play in one category but the prizes are separate. Below are the Top 3 winners for the championship. 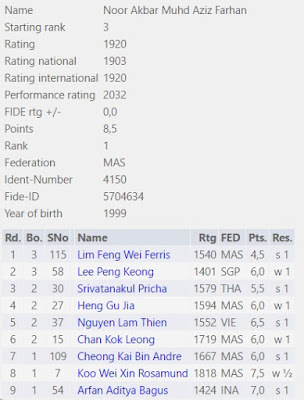 GiLoCatur considers it unofficial because GiLoCatur does not have the Final Ranking hard copy and it is not available yet at chess-results.com. In the Women's Section, Nur Nabila Azman Hisham emerges as the champion after collecting 7/9 points while Alia Anin Azwa Bakri is the First Runner Up with 6/9 points. Meanwhile, the Second Runner Up goes to Fairuz Hamizah Ahmad Fuad (as GiLoCatur remembers). 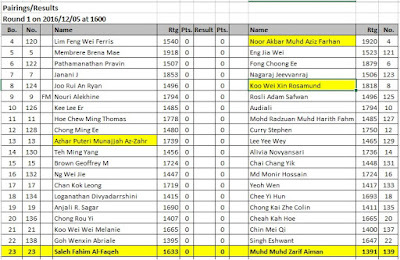 In the Men's Section, Muhd Ali Chor emerges as the champion after collecting 7.5/9 points while Mohd Nabil Azman Hisham is the First Runner Up with 7/9 points. Meanwhile, the Second Runner Up goes to Fikri Saleh. 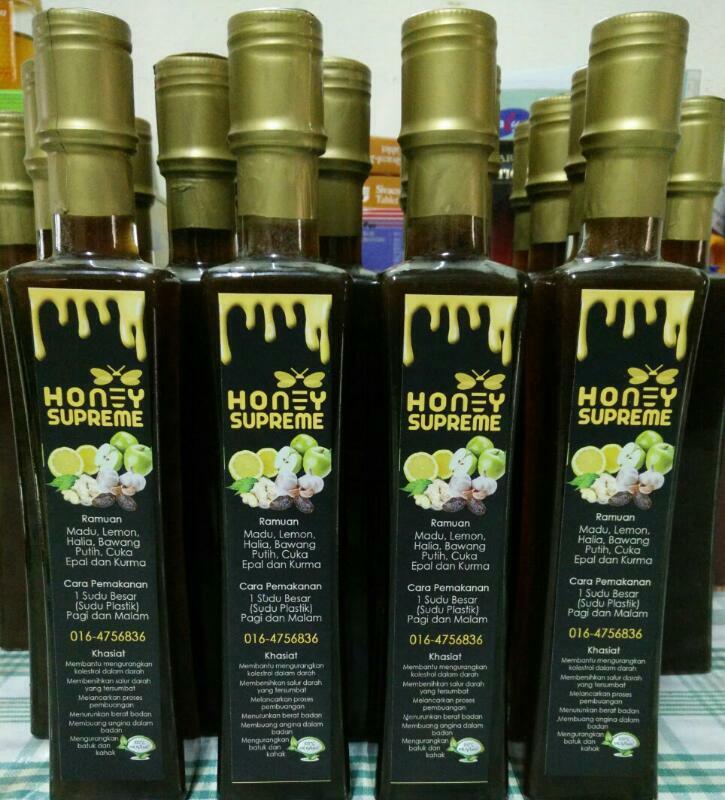 GiLoCatur was born in Sabak Bernam district which is located in the northern part of Selangor 48 years ago. 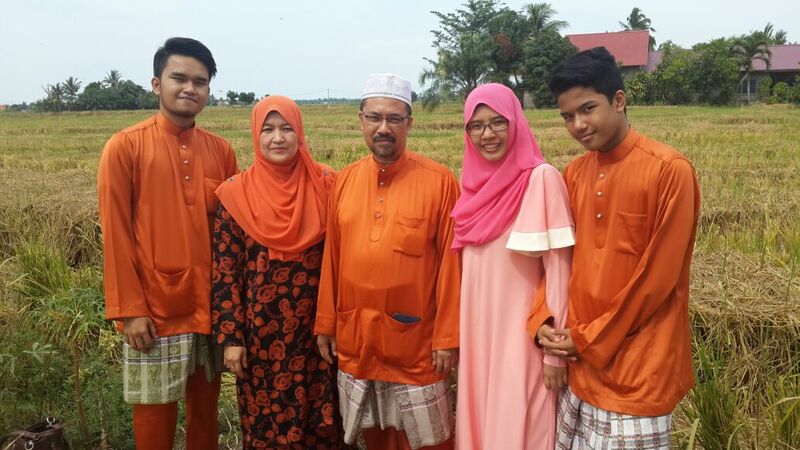 GiLoCatur's father named Abdul Latif built a house on Jalan Sultan in the village called Sungai Tengar in 1951. GiLoCatur had the elementary school at SKST or Sekolah Kebangsaan Sungai Tengar from 1975 until 1980. Why GiLoCatur told about this? Unfortunately, GiLoCatur could not take part in the Closed chess tournament. But GiLoCatur followed the tournament from Shah Alam. 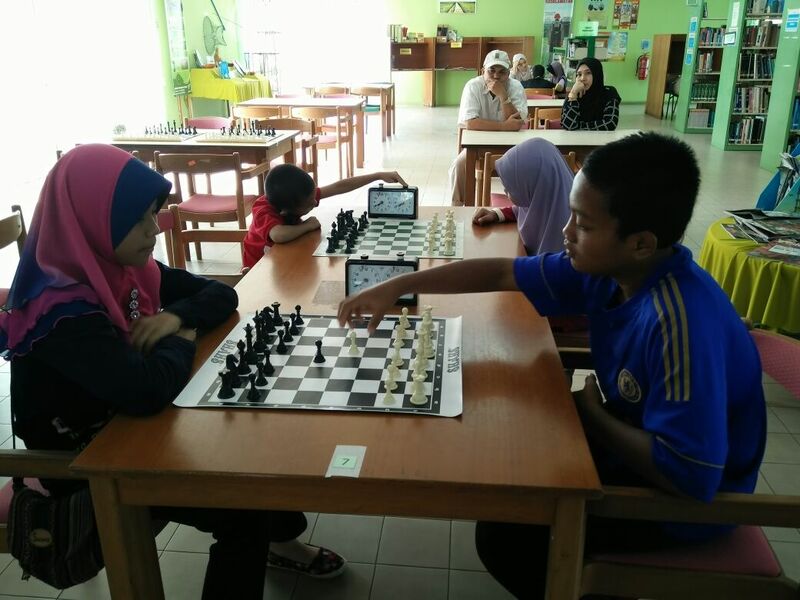 It is long due that more and more chess tournaments are held and organized in Sabak Bernam district. GiLoCatur dreams that Sabak Bernam can have many strong chess players. GiLoCatur dreams that more and more chess players from the district to represent Selangor in the MSSM chess championship. GiLoCatur strongly hopes that the newly elected MCF President and committees can help all chess clubs all over the country like Sabak Bernam Chess Club in the chess development and events. 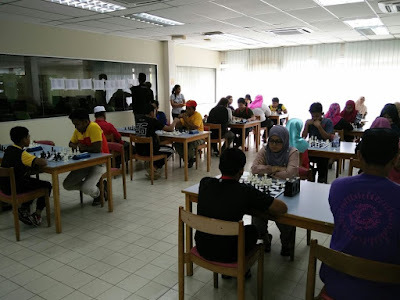 GiLoCatur shares several photos taken during the Sabak Bernam Chess Closed held today. 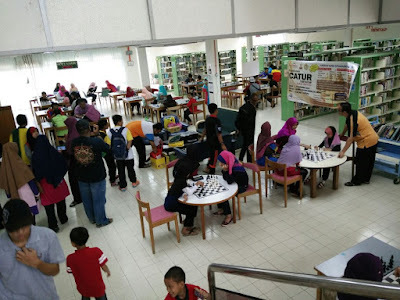 Bravo and Kudos to all the people involved in making the Sabak Bernam Chess Closed event successful. Both 3rd Johor International Chess Open and Johor International Chess Challenger have just ended today. 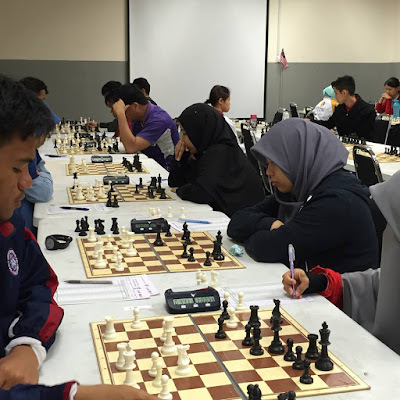 The chess championships which kicked off six days ago completed their final 9th round today's afternoon. There were 65 and 118 participants took part in the championships respectively in the Open and the Challenger categories. 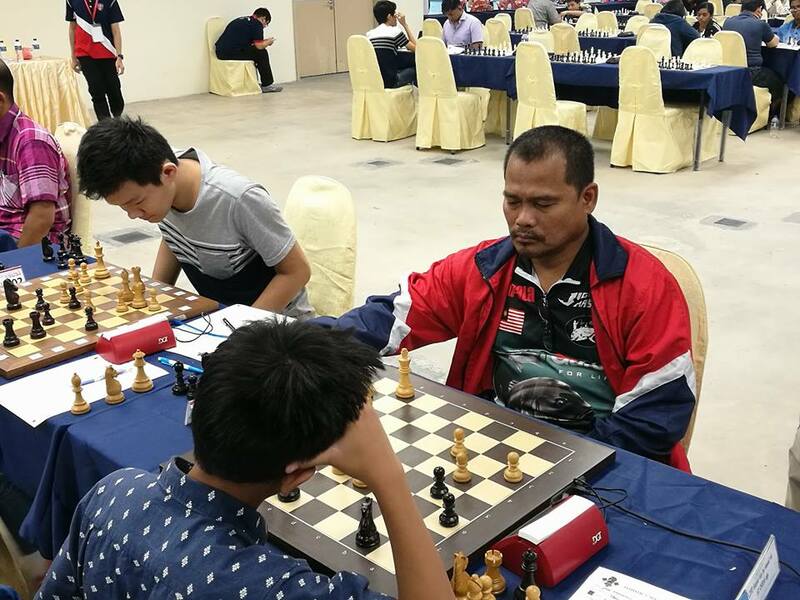 In the Challenger category, Cikgu Taulani Tukiran (below picture) emerged as the champion. 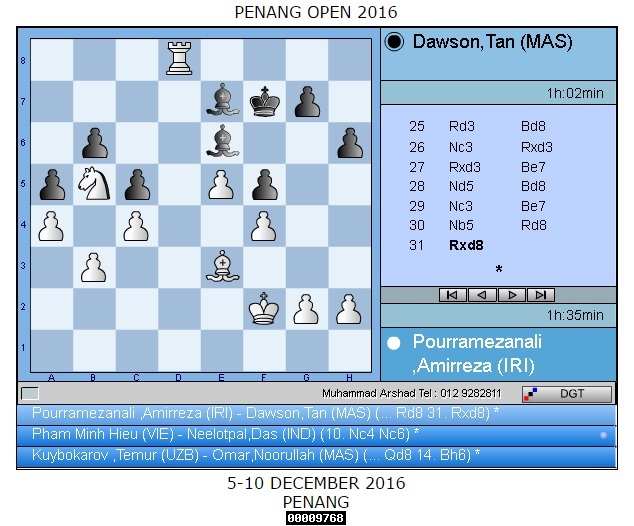 He scores impressively by winning all nine rounds. 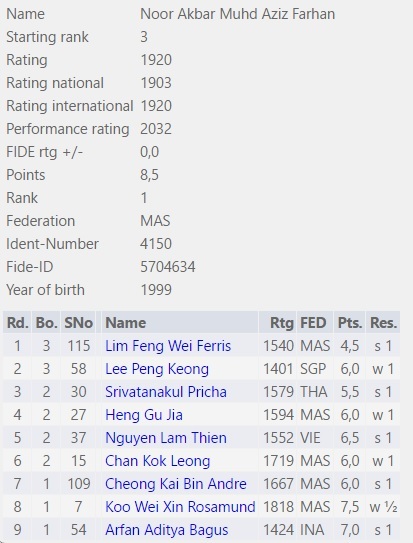 He denies the championship going to Indonesia when the First Runner Up,Cecilia Natalie Liuviann, just managed scoring 7.5/9 points, trailing by 1.5 point. Below is the Top 10 Final Ranking for the 3rd Johor International Chess Championship in the Challenger category. 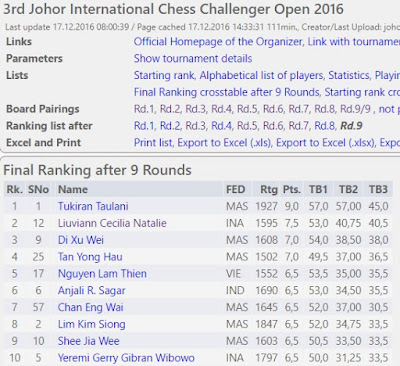 Go to http://chess-results.com/tnr253589.aspx?lan=1&art=1&rd=9&wi=821 for the full results. 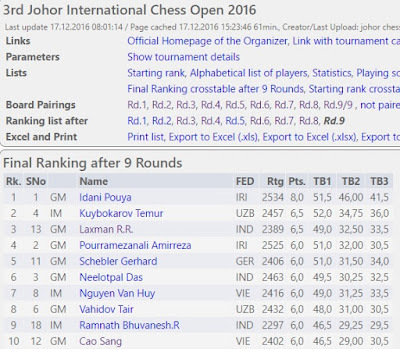 Meanwhile, GM Pouya Idani, the Top seed, from the republic of Iran has emerged as the champion in the Open section. 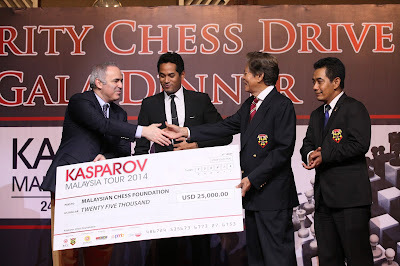 He has denied Uzbek International Master Temur Kuybokarov, the Fourth seed, from winning back-to-back The Penang Open and The Johor Open. 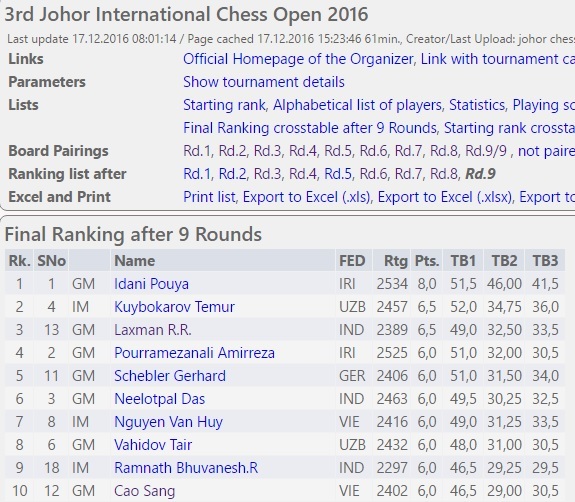 Below is the Top 10 Final Ranking for the 3rd Johor International Chess Championship in the Open category. Go to http://chess-results.com/tnr253587.aspx?lan=1&art=1&rd=9&wi=821 for the full results. Congratulation to Cikgu Taulani and all the winners in the Johor International Chess Championships. 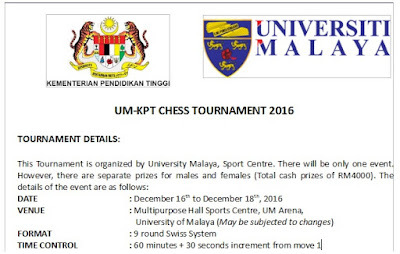 Today, Friday 16/12/2016, the 2nd Edition of UM-IPT or UM-KPT Chess Championship began its first three rounds. Unlike the first Edition where there were seven rounds, this year Edition there are nine rounds. Fikri is taking part for the second time in this tournament. Last year the tournament was held from 13th until 15th November where Fikri was celebrating his 19th birthday on the first day of the tournament. 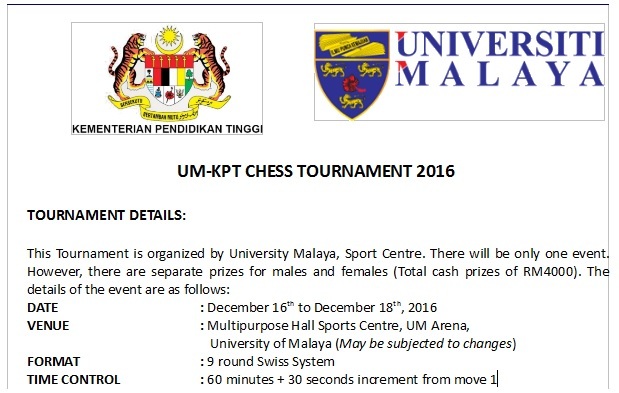 Meanwhile, this year the tournament is held in mid December from 16th until 18th. GiLoCatur has yet been at the tournament venue. Therefore, no pictures to share in this blog for the moment. GiLoCatur would like to share several pictures during last year edition. All the pictures are from MUICC UiTM facebook. 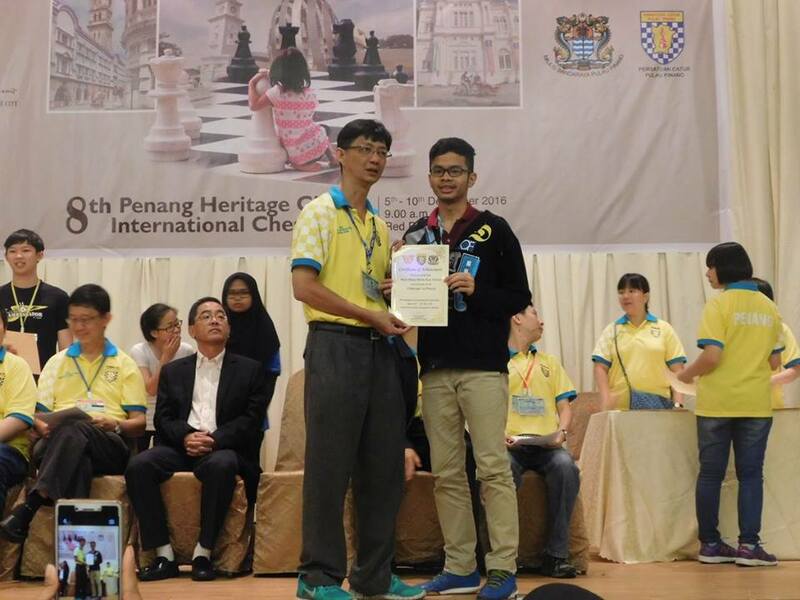 Last year Chan Sheng Yip emerged Top scoring 6.5/7 points. In this year edition, he is not taking part. Who will emerge Top in the second edition this year? Let's wait and see. AGM MCF sedang berlansung di OCM. 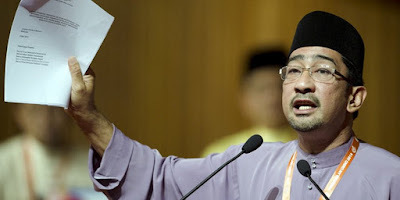 Jawatan Presiden MCF sudah diketahui siapa pemenangnya pada kira-kira jam 12:30 PM tadi. 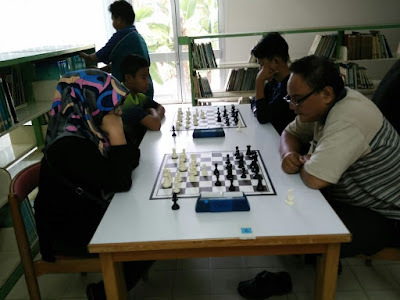 Dato' Zahidi telah menewaskan Datuk Nazif dengan undian 32 - 23. GiLoCatur kurang mengenali Presiden baru MCF. Carian google memberikan info berikut tentang beliau. Datuk Zahidi yang dilahirkan pada tahun 1961 merupakan Ahli Parlimen P001 iaitu Padang Besar. Antara jawatan yang disandang oleh beliau adalah Pengerusi IKIAM. Sebagai pendokong catur di Malaysia, GiLoCatur mengharapkan Presiden baru MCF akan bersemangat (seperti dalam gambar di atas) dalam menerajui komuniti catur Malaysia, memaju, memacu dan mempopularkan sukan catur terutamanya di Malaysia. Sementara pengiraan undian untuk jawatan Timbalan Presiden juga sudah selesai. Tengku Ahmad Badli Shah telah menang dengan undian sebanyak 31 - 24. Mengikut sumber dari rakan blogger di AGM MCF, Berikut adalah senarai AJK MCF yang baru setelah menang dalam pengundian. 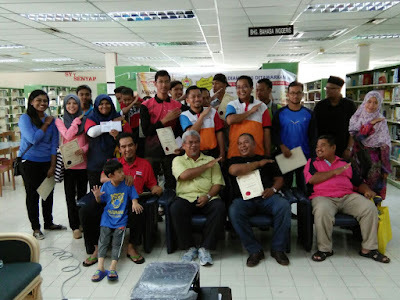 Syabas kepada yang menang! 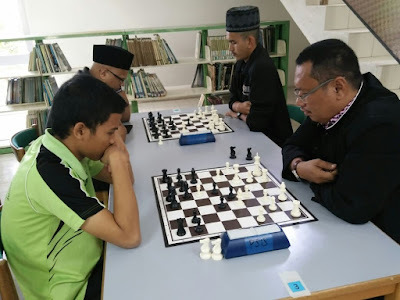 GiLoCatur amat amat mengharapkan CATUR akn lebih maju, progresif dan banyak program-progran pembangungan di bawah AJK MCF yang baru. 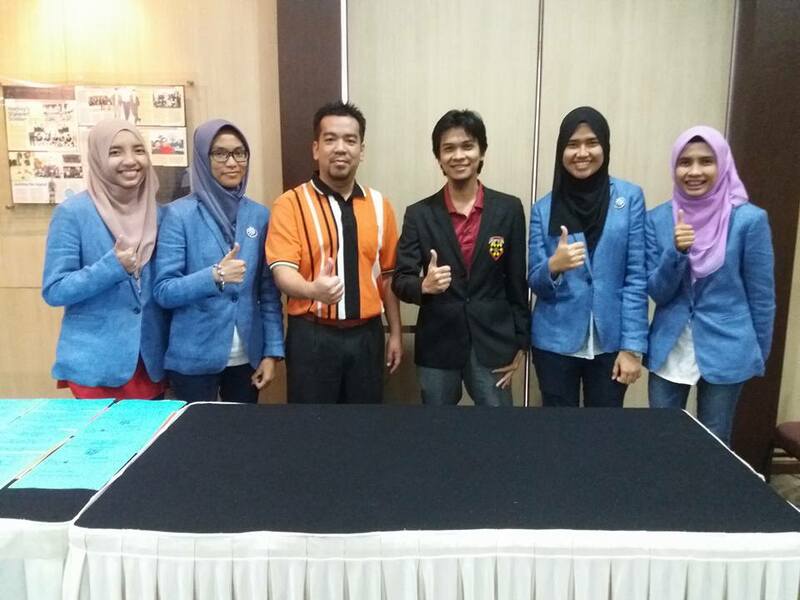 Pasukan Catur Olimpiad Wanita 2016 telah diberi penghargaan dalam AGM MCF ini. 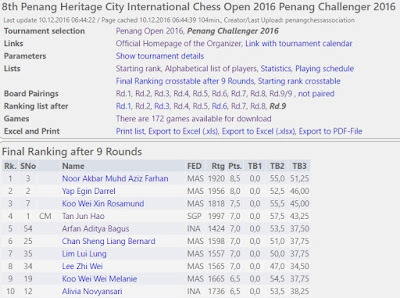 Mereka telah bermain sangat cemerlang di Catur Olimpiad 2016 yang diadakan di Baku, Azerbaijan dengan memenangi Kategori C.
The first round of the 8th Penang Heritage City International Chess Open 2016 has just begun minutes ago. 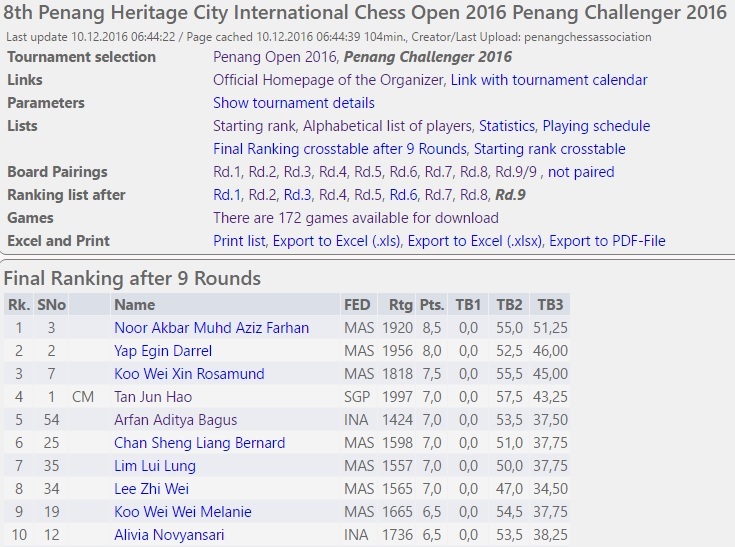 There are two categories - The Open and The Challenger for chess players with below 2000 Elo ratings. 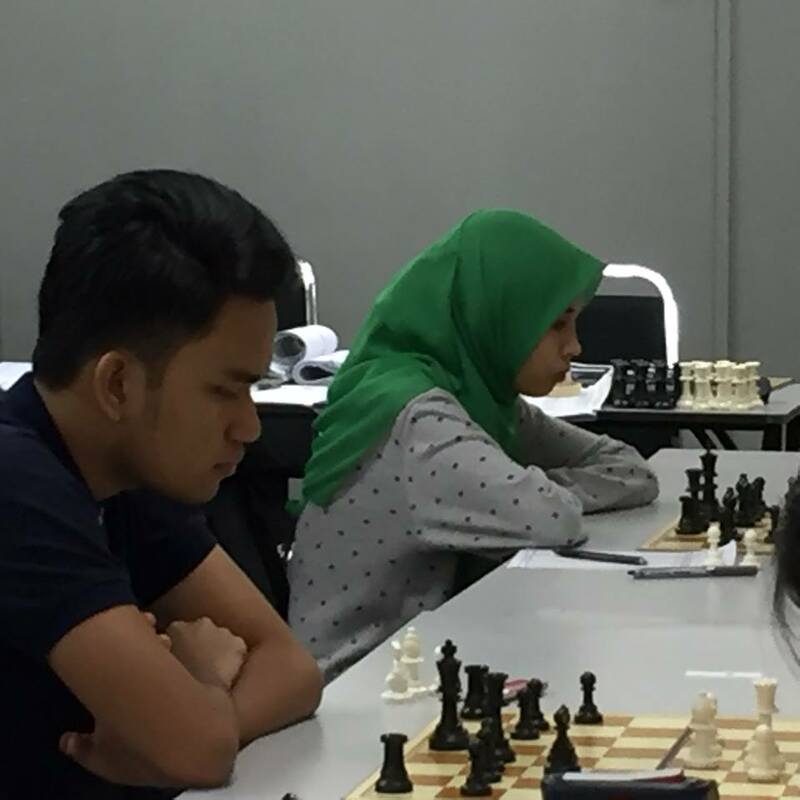 All the participants will play nine SWISS 90 minutes + 30 seconds increment format rounds. 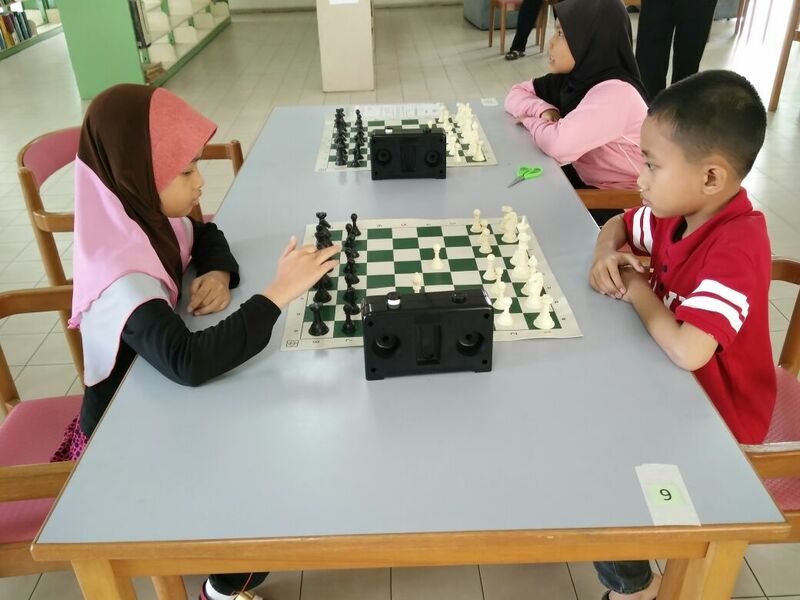 GiLoCatur's youngest child, Fahim, is taking part in the tournament in the Challenger category with his other five school mates. Fahim is ranked 23rd out of 231 total participants in the Challenger category with Elo ratings of 1633. 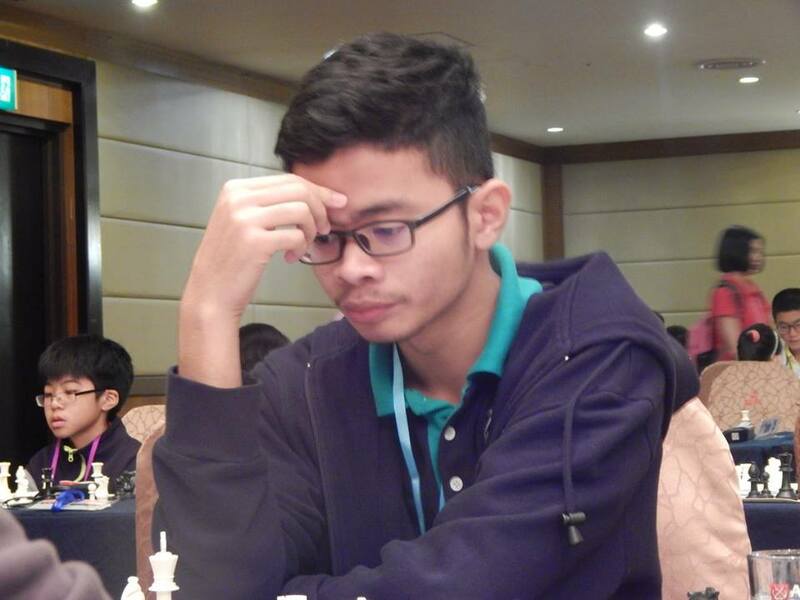 In the first round, he plays white on Board 23 against Muhd Zarif Aiman (the son of KedaiCatur's Muhammad Arshad GiLoCatur believes). 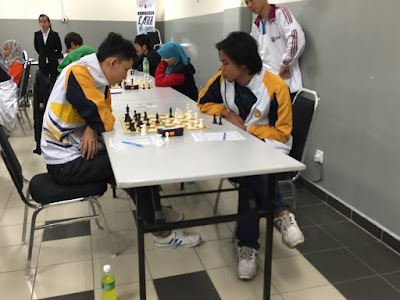 Meanwhile, one of GiLoCatur's chess buddies, Masrin, also takes part in the international chess tournament. 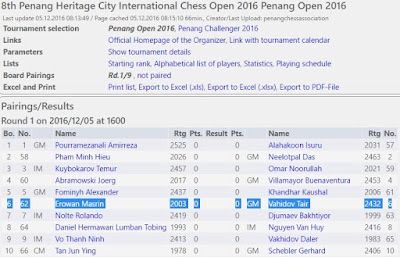 In the first round, playing in the Open category he has an uphill battle against the sixth-ranked player with 2432 Elo ratings, GM Vahidov Tahir. For info, there are 112 participants in this category. To follow the results and pairing for the tournament, please go to following URLs. There are three live broadcasts of the Top 3 boards of the tournament which can be followed. 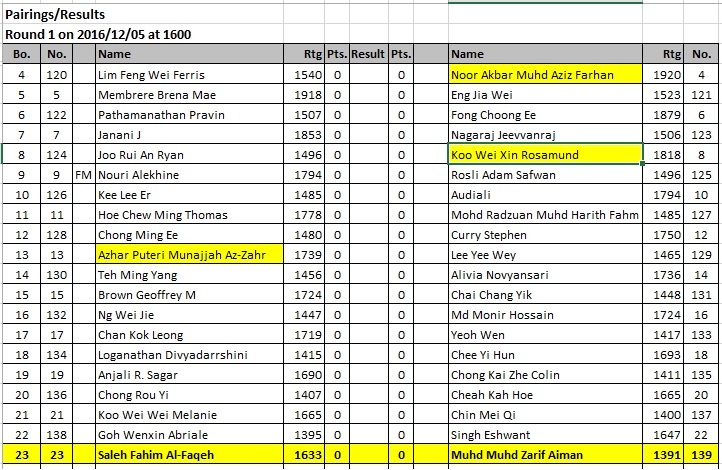 ALL THE BEST to both Fahim and Masrin as well as to all the participants in the tournament. The year 2017 will come in less than one month. How the time flies so quickly these days. 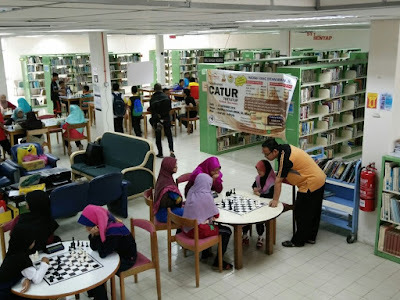 There are so many local chess tournaments this year where GiLoCatur can not keep up. 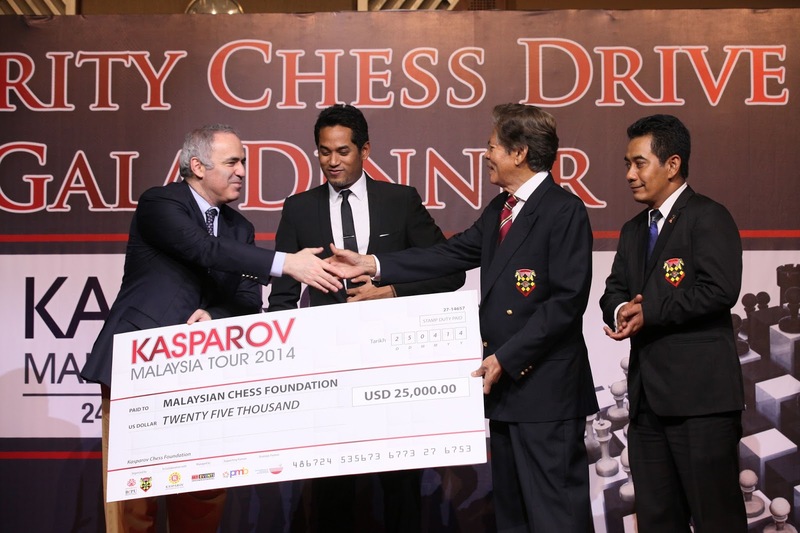 A very positive sign for the Malaysian chess community. 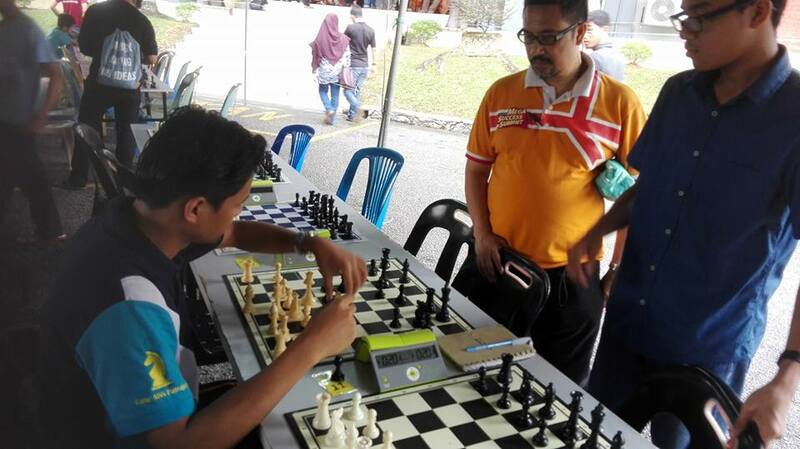 GiLoCatur believes no one can provide the complete list of the local chess tournaments this year. 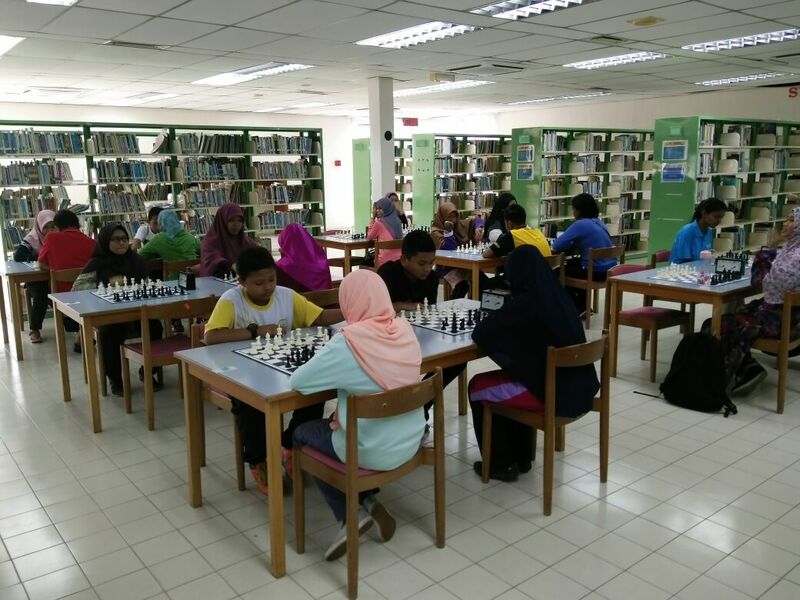 Therefore, for the year of 2017, GiLoCatur will try to compile a complete list of local chess tournaments.